According to the Environmental Protection Agency (EPA), the average U.S. household generates more than twenty pounds of household hazardous waste (HHW) each year for an estimated total of 530,000 tons nationally. HHW items include products for your car, such as anti-freeze, motor oil and brake fluid as well as products around the house, like fluorescent light bulbs, paint, cleaning products and pesticides. These items are often accompanied by warning labels that read caution flammable, poison or corrosive. 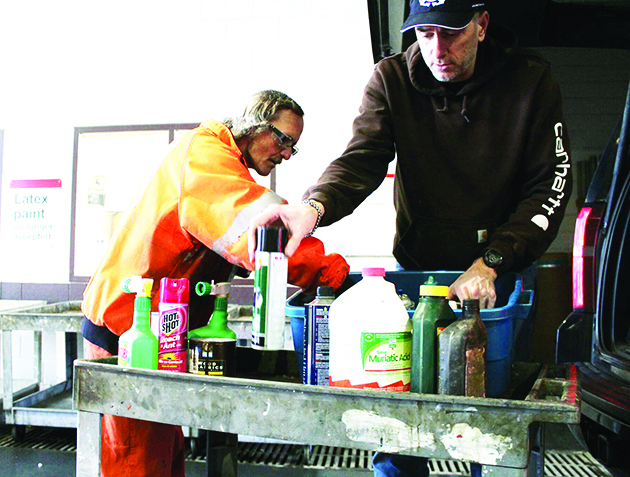 Improper disposal of these items, like pouring excess paint, oil or chemicals down the drain, in the trash or off the side of the road, are leading to serious concerns for Mother Earth and all of her inhabitants. At the turn of the 21st century, the EPA conducted a study which showed that pharmaceuticals and personal health care products (PPCP) in bodies of water were becoming an ‘emerging concern’ for fish. Overtime, the PPCPs bio-accumulate in the fish’s tissue, which can lead to endocrine system disruption causing reproductive and behavioral problems for the fish. Though that particular study did not focus on HHW like motor oil and paint thinner, it did show that the chemicals eventually work their way back up the food chain and now pose a problem for people. “You can only eat an x amount of salmon and tuna now because of mercury; we have mercury in our light bulbs,” David explains. “These are called PBTs, or persistent bio-accumulative toxins, that the EPA tries to keep out of the environment. Some of them are in paints, light bulbs, and pesticides – a lot of these things we spray outdoors or spill accidentally. When they get into a body of water, they get into our body by getting into the bodies of the things we eat. And when that accumulates it can cause problems. 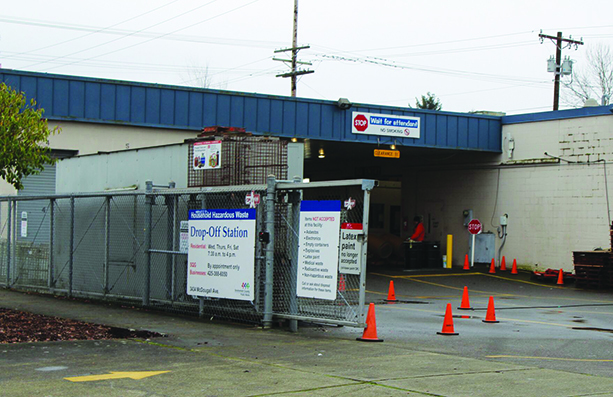 The Household Hazardous Waste Drop-Off Station is located at 434 McDougall Avenue, off Broadway in Everett. Snohomish County provides free disposal of HHW products for their residents at the Household Hazardous Waste Drop-Off Station in Everett. The station accepts a variety of HHW products and is located at 3434 McDougall Avenue, off Broadway, a block adjacent to the Brown Bear Car Wash. The station collects and separates HHW to be recycled, consolidated and disposed of safely. They will also accept hazardous waste from small businesses that qualify as a small quantity generator, by appointment and for a fee. 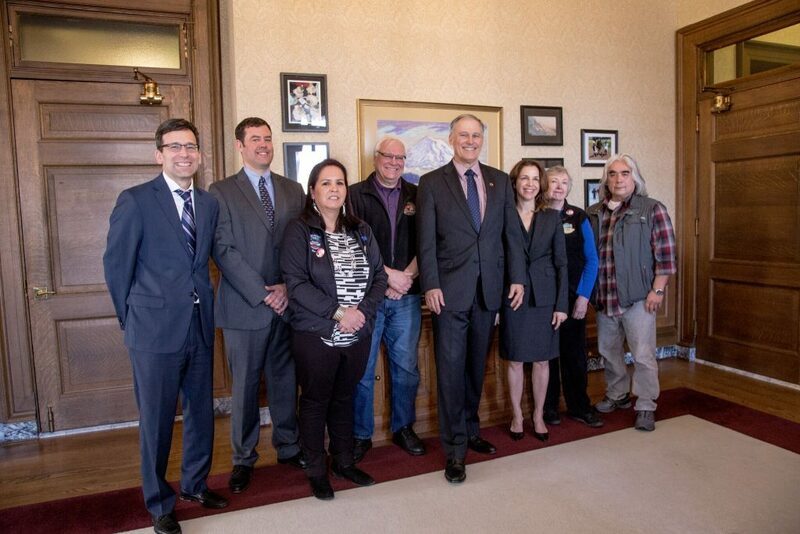 OLYMPIA—Today, coastal and statewide elected officials, tribal and fishing industry representatives, and conservation advocates spoke in united opposition to a new federal proposal that would open Washington’s coast to oil and gas drilling for the first time in 50 years. On Jan. 4 of this year, the Trump administration released its 2019-2024 draft plan which would open up 90 percent of the nation’s coastline—including Washington’s—to oil and gas drilling. Attorney General Bob Ferguson sent a letter today to Interior Secretary Ryan Zinke, opposing President Donald Trump’s proposal to allow oil and gas drilling off Washington’s coast and asking that Washington be exempted. If Washington is not removed from the plan, Ferguson warned Zinke he will file a lawsuit. The Governor, the Attorney General, representatives from the Quinault Indian Nation, the Makah Tribe, the president of the Washington Dungeness Crab Fishermen’s Association, the mayor of Ocean Shores and the Commissioner of Public Lands spoke about Washington’s commitment to protecting a fishing, tourism and recreation economy worth millions of dollars from the threat of pollution and oil spills. They pointed to the long-term impacts from the Exxon Valdez and Deepwater Horizon disasters on fisheries and businesses. NOAA data from 2015 states that they respond to 100 oil spills in U.S. waters every year. In December, however, the Trump administration announced it will roll back federal safety rules created following the Deepwater Horizon disaster. Annual recreational fishing effort on Washington’s coast averaged 47,000 trips on charter vessels and another 98,000 trips on private vessels between 2003 and 2014. In 2014, trip-related expenditures for coastal recreational fishing generated over $30 million in coastal spending, supported 325 jobs in coastal counties, and contributed $17 million in labor income. BOEM’s Washington state public meeting has been postponed until further notice after their venue in Tacoma, the Landmark Convention Center, cancelled the room rental for Feb. 5. BOEM is accepting public comments on the 2019-2024 drilling proposal online through March 9. After the comments are received and environmental reviews conducted, the Proposed Program will be released, triggering another comment period. The Final Proposed Program is expected by 2019. The current plan includes six lease sales off California and one off Oregon and Washington. TACOMA—On Feb. 5, hundreds of Washingtonians will travel to Tacoma to voice their opposition to a federal proposal that would open up 90 percent of the nation’s coastline—including Washington’s—to oil and gas drilling. The proposal, issued by the Department of Interior in January, threatens a fishing, tourism and recreation economy worth millions of dollars. 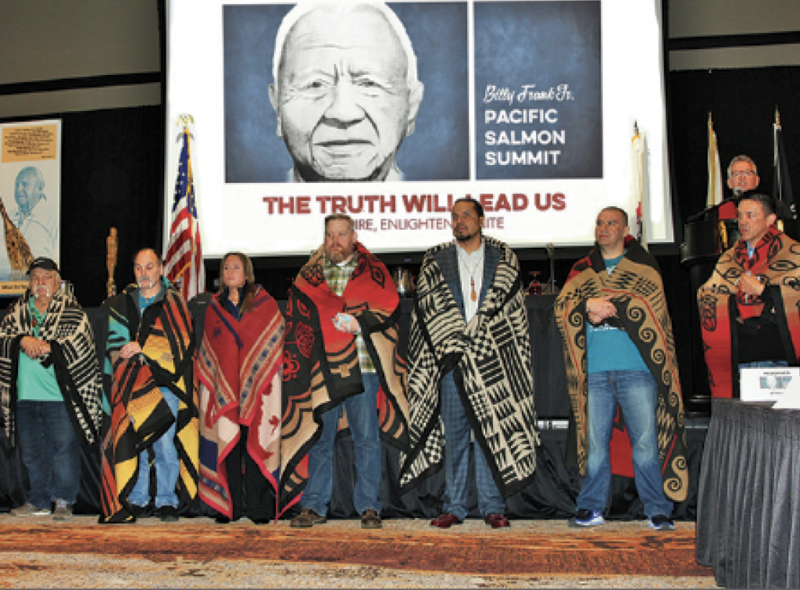 The Feb. 5 events will unite Washington’s business, fishing, tribal, tourism and conservation interests with elected leaders including Gov. Jay Inslee. Background: On January 4, 2018, the Trump administration released the 2019-2024 draft plan to drill for oil and gas in U.S. waters. Washington officials immediately voiced their opposition, joining coastal leaders from both parties around the country in urging the Department of the Interior to protect their economies and communities. The Pacific Coast has been closed to new drilling for over 3 decades, with the last federal lease sales taking place in 1984. Commercial, tribal, and sport fishing, tourism and recreation businesses are threatened by the prospect of increased risks of an oil spill. The Bureau of Ocean Energy Management is accepting public comments on the draft plan through March 9, and will hold a single public hearing in each state to gather additional input. The plan will undergo two more rounds of revisions and review before it is finalized. Quil Ceda Village (QCV) is taking a huge step in protecting the environment by prohibiting the use of plastic carryout bags in all of the businesses located within the city. Effective January 1, 2018, grocery and retail stores as well as restaurants will convert from plastic to paper, in an effort to go green. 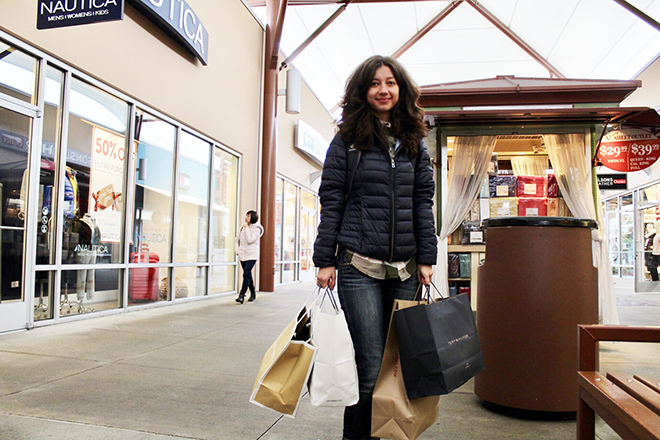 QCV is home to several large companies including Walmart, Home Depot, Cabela’s and the Seattle Premium Outlets, not to mention the Tulalip Resort Casino, Tulalip Bingo, Quil Ceda Creek Casino and numerous eateries. With so many businesses that utilize plastic bags, you might think a huge change like banning them entirely would ruffle a few feathers. However, the ordinance has appeared to garner more praise than protest and is in the midst of smooth transition, thanks to long-term planning. Learning of the terrible impact plastic bags have on the environment, the QCV team had a brainstorming session with the Tulalip Board of Directors on ways the newly established city can be more environmentally friendly and conscious. As many know, plastic is a non-recyclable material that takes hundreds of years to break down into micro-plastics, which often travel to the ocean causing further pollution. According to the Center for Biological Diversity, the average American household accrues over 1,500 plastic bags annually and recycle less than one percent of those bags. Currently the ocean is littered with plastic bags and plastic toxins that are killing over 100,000 marine animals every year. 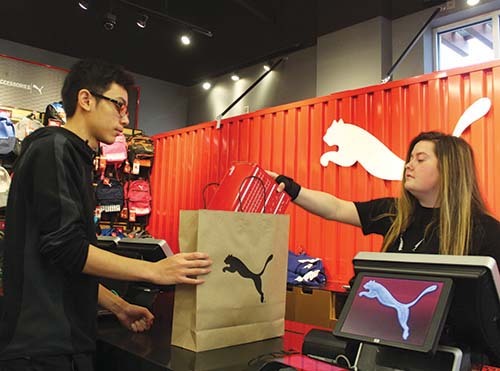 Several department managers at the Seattle Premium Outlets described the ordinance as ‘wonderful’ and ‘great’ while a Disney employee called it ‘inspiring’, stating that guests from nearby counties want their cities to follow in QCV’s footsteps. Over fifty percent of the one-hundred and thirty stores at the outlets already switched to reusable and recyclable bags before the ordinance was even announced, including Disney who sells reusable totes that feature their famous, loveable characters. Stores that were still offering plastic bags are phasing out their inventory during the holidays. A few stores such as Nike and Hot Topic are electing to switch to reusable, biodegradable bags that are in compliance with the ordinance, while other stores such as Pro Image Sports chose to stop offering bags completely. There are a few exceptions to the plastic ban, including plastic bags used for produce and meat at grocery stores as well as to-go bags for restaurants, though Quil Ceda Administrative Director, Nina Reece, stated that the majority of the restaurants are switching to paper. Shoppers are encouraged to BYOB (Bring Your Own Bag) once the new year begins as some stores may charge a bag fee. The Tulalip Resort Casino moved away from the usage of plastic bags a few years ago and offers their T Spa, Salal Floral and gift shop guests paper bags. Similar to the outlets, Cabela’s and Walmart are using the remainder of their plastic bags until the ordinance goes into effect and have their paper and reusable bags set and ready to go. The ordinance originally had a tentative start date last spring and in preparation for that date, Home Depot was the first company in QCV to successfully switch entirely from plastic to paper. Any businesses that violate the ordinance can be fined for each plastic bag handed out, up to a maximum of $250 per day. 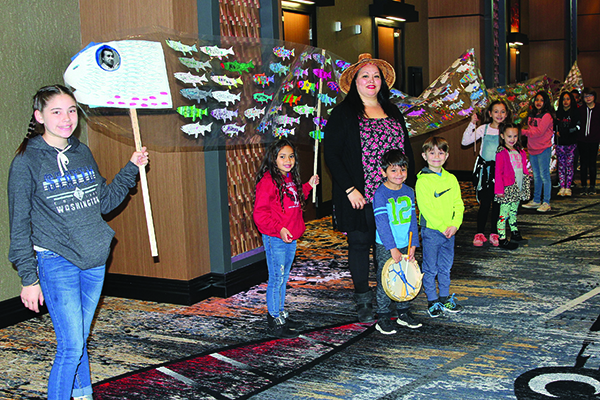 The ordinance aims to improve, sustain and protect the environment from plastic pollution and is an inspiring decision by the Tulalip Tribes and the city of Quil Ceda Village. For more information, please contact Quil Ceda Village at (360) 716-5000. By Valerie Streeter, Tuallip Tribes Natural Resources Dept. 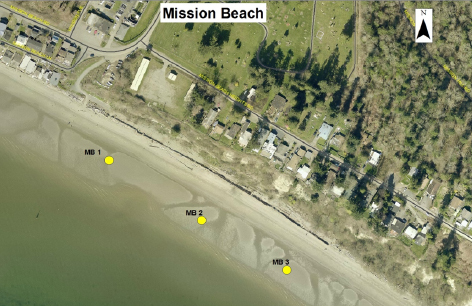 This summer, WSU Beach Watchers volunteers are monitoring the quality of water at Mission Beach each week until August 29. Harvey Eastman at the Tulalip Water Quality Lab analyzes the water samples. So far, the beach has been sampled eight (8) times. The results show that bacteria levels in the water are low, well below the threshold limit for swimming, which means that the water is clean! 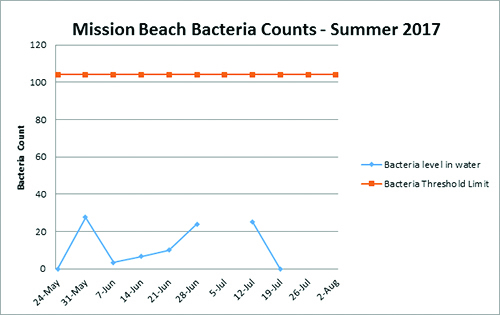 The graphs below show the average result from the three beach sampling stations for this year as well as last year. 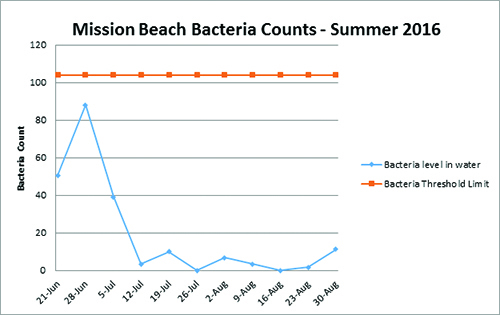 The red line shows the bacteria threshold limit and the blue line is the amount of bacteria in the water at Mission Beach. If bacterial levels are above the threshold limit, there are more chances for skin infections or gastrointestinal illness from too much pollution. * No samples were taken on July 4. Community members share their top five climate change concerns,.Natural Resources will utilize and refer to this data while developing the adaptation plan throughout the next six months. Countless studies have shown that since the 1900’s, the Earth’s heat has increased by about 1.33 degrees Fahrenheit. That is at an alarming rate considering that leading up to the Industrial Revolution, the planets heat only increased by about nine degrees over the span of 5,000 years. Due to the burning of fossil fuels, excessive carbon dioxide has been released into the atmosphere over the last century. Carbon dioxide is produced by humans, animals and plants; but also by human activity such as generating electricity and using gasoline for vehicles. Carbon dioxide traps radiated heat from the sun, at the top of the Earth’s atmosphere, causing the planet’s temperature to increase. The more heat that is trapped, the warmer the planet becomes. If the Earth’s population continues to burn fossil fuels at its current rate, over the next century, future generations will face extreme weather including draughts, floods and storms. Recent studies claim that in the year 2100, heat waves will last up to twenty days and will result in many deaths around the entire world. Climate change is inevitable, however, many environmentalists believe the process can be slowed by means of conserving energy, utilizing other forms of transportation and recycling. 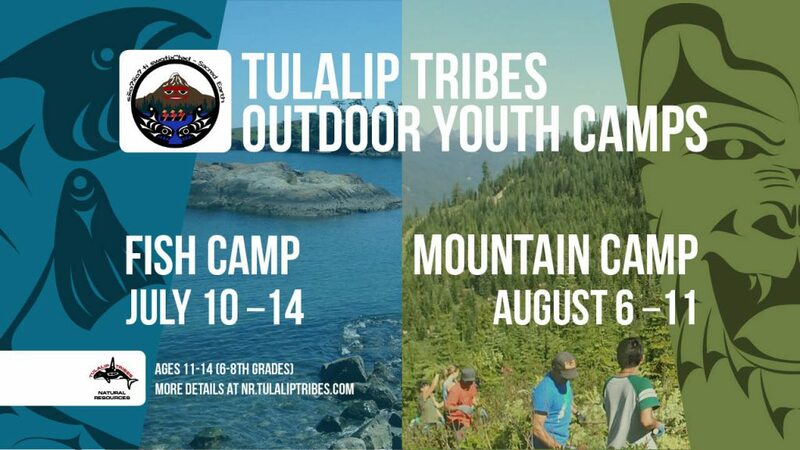 The Tulalip Tribes are among the many tribal nations, environmentalists and scientists studying the cause and effect of climate change and how it will affect future generations. 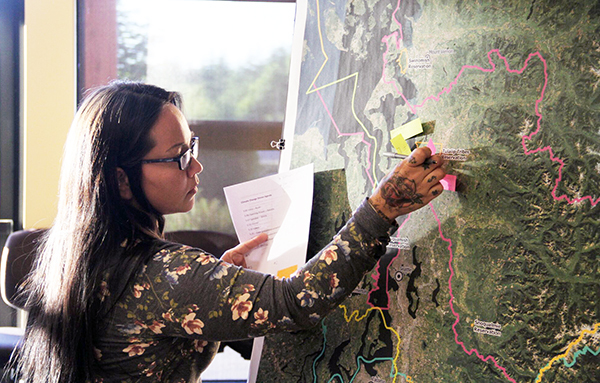 Tulalip’s Natural Resource Department recently held a community dinner at the Tulalip Administration Building to discuss climate change and how it will impact Tulalip and its surrounding areas. The community dinner included presentations by Tulalip Natural Resources Environmental Scientist, Colin Wahl, as well as guest speaker Clarita Lefthand-Begay of the Navajo Nation, who is an Environmental Professor at the University of Washington. Colin’s presentation provided a brief overview of climate change, explaining ocean acidification, sea level rise and how global warming will impact salmon runs in the future. 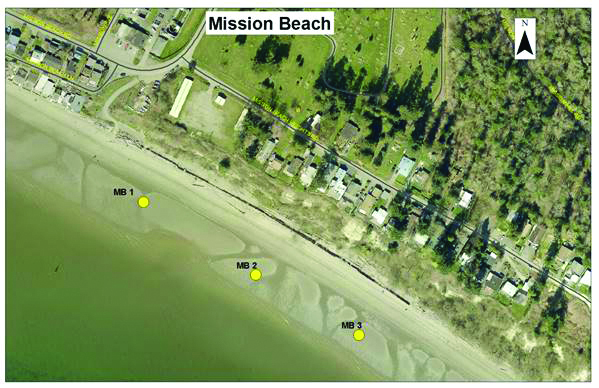 Colin stated that due to the impacts from sea level rise, various areas of the reservation will experience beach loss. Areas that will be affected include Tulalip Bay, Hermosa Beach, Priest Point and the Qwuloolt Estuary. Colin used charts to compare and contrast the areas today and the same area eighty years in the future. He also explained that the Natural Resources Department is in the early stages of developing a Climate Change Adaption Plan which will take approximately six months to complete before the implementation process begins. “We’re going to be developing strategies to preserve tribal customs and culture first and foremost,” Colin stated. “We’re also developing strategies to protect tribal property and infrastructure. We’re working with all the different departments within the administration, including Planning in particular, they’ll be an essential element throughout the process. We also need to protect and restore treaty resources, or continue to do so, so that the Tribe’s customs and culture can extend into the future. Clarita spoke with the community before leading an open forum discussion. During her presentation she spoke in detail about the dangers of climate change, stating that by the year 2100, the earth will regularly experience extreme heat waves, air pollution as well as water and food borne illnesses. She also states that the food of future generations including shellfish, fish, meat, fresh fruits and vegetables will all be negatively affected by climate change. Clarita explained that the populations most affected by climate change will be elders, children, pregnant women, individuals with compromised immune systems as well as poverty-stricken families. The climate change dinner concluded with an open discussion for the community to voice their concerns regarding the impacts of climate change. Clarita and the Natural Resources team wrote documented the many concerns. Following the discussion, the participants were given five post-it stickers, each a different color, and asked to rate their top five concerns. Natural Resources will utilize and refer to this data while developing the adaptation plan throughout the next six months.